Brunswick Zone Hawthorn Lane will host the Woman's 10th Annual 8-Pin No-Tap Handicap Tournament Saturday, October 27, 2018 at 2:00 pm. Early-bird entry into this event is $18.00 and reserved entries close October 24, 2018. 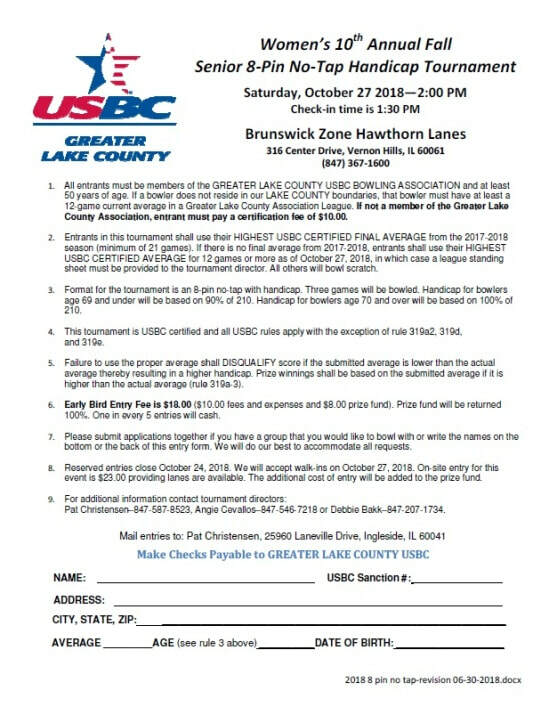 This event is open to all Greater Lake County USBC women bowlers who are at least 50 years of age. The entry form for this event can be downloaded from the GLCUSBC website, entry forms will also be available in your local bowling center.